c. 1860: A mummy stolen by the infamous grave-robbing Abu-Rassul family is sold to Scottish-born surgeon Dr. James Douglas, who brings it to North America. It is subsequently exhibited for 138 years in the Niagara Falls Museum in Ontario, Canada, and promoted as General Ossipumphnoferu (2nd image). "In the Museum’s place of honor, like a bearded Sleeping Beauty in a glass coffin, lay Ossipumpneferu himself. He was identified as a general who had saved Pharaoh Thutmose III from the attack of a raging elephant while the warrior-king was campaigning in Syria," describes Canadian Egyptologist Gayle Gibson. c. 1960: Rumors that the museum owned a royal mummy begin circulating after it is visited by German tourist Meinhard Hoffman and later by German Egyptologist Arne Eggebrecht. 1998: The museum is purchased by ethnologist Bill Jamieson, whom I've been in occasional contact since the late 1990s, when I learned of his collection of shrunken heads. 1999: Jamieson sells the 9 mummies in the museum's Egyptian Collection to the Michael C. Carlos Museum at Atlanta's Emory University for $2 million. After analyzing CT scans, X-rays, skull measurements, DNA test results, and the findings of radio-carbon dating, researchers conclude that the identity of the mummy was 19th dynasty pharoah Ramesses I. The crossed arms characteristic of a royal mummy and a distinct family resemblance bolster this determination. "There was never any question about whether the mummy would be returned to Egypt if it proved to be a royal. It was simply the right thing to do," said curator Peter Lacovara. 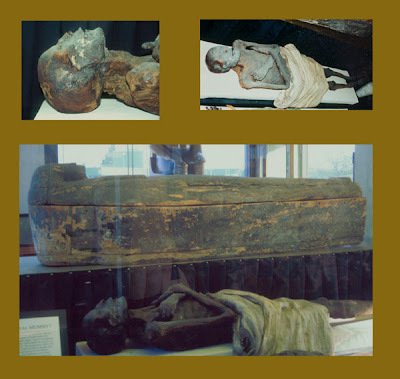 2003: The mummy of Ramesses I is returned to Egypt with full official honors and, after being reunited with his coffin lid and items from his tomb, is exhibited at the Luxor Museum.